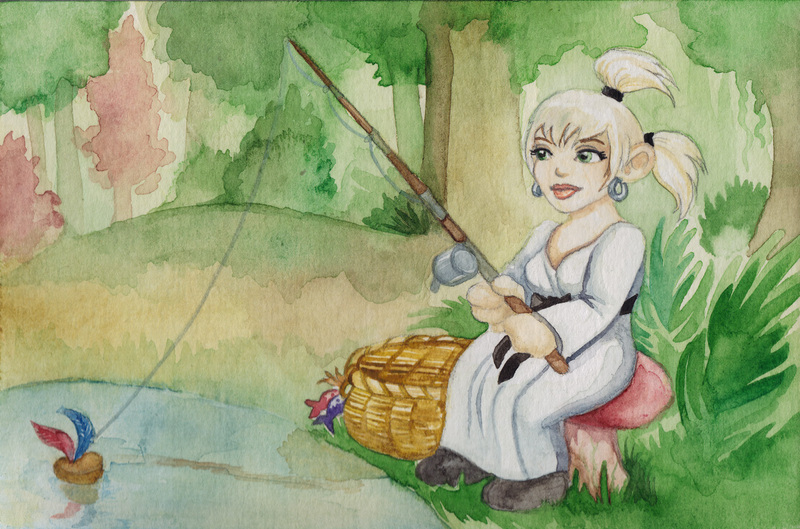 This is an image I was recently commissioned to do as a super-secret surprise painting gift, so I can’t tell you more about the character except that she likes to fish. I also like to fish, so this was really fun to do. My client wanted a sort of dreamy, hazy feel and greens from Feralas or similar, so we went with that. I liked finding the right fishing basket, also called a “creel,” which I didn’t know before. So I also learned something new! A gnome after my own heart. 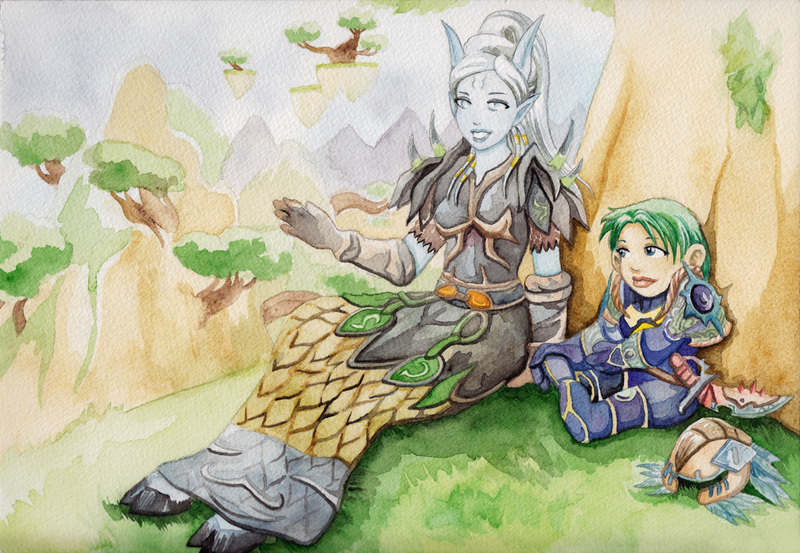 I recently did this watercolour painting as a surprise gift! 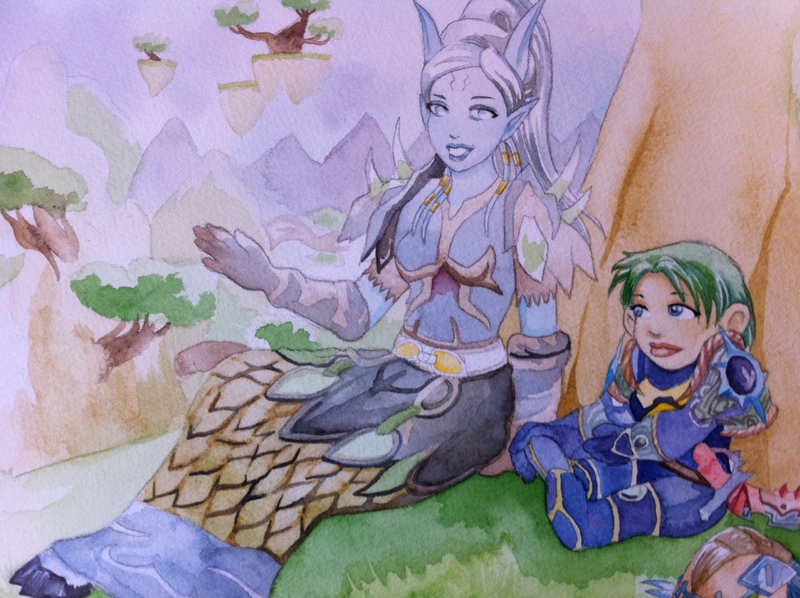 (Not a gift from me, a surprise gift from one girlfriend to another of their WoW characters). I really enjoyed trying to capture a dynamic between the two characters and giving them some scenery. I took a few progress images with my phone/scanner, so I thought it’d be fun to share those. Final sketch before painting. This is not the "first" sketch. This next image is a bit shadowy because of being taken with my phone (I don’t scan at this stage because the paper is often still a bit damp and I don’t want to chance dirtying it). In case I haven’t mentioned this…photographing a painting is hard. Especially when you have to hold the painting in one hand, and the camera in the other (without getting your hands into the photo). Not finished, but getting there! The above still needs detailing on the shaman dress primarily. This is the final image, scanned in and colour balanced as best I can. Scanning watercolours is tough because some subtleties always seem to be lost. I’ve found that the best way to handle this is to not use the scanner driver (my scanning software has an option) and then to turn off “Auto Tone” in the more advanced settings. This seems to prevent the scanner from washing out the lighter areas by trying to pre-set the contrast itself. 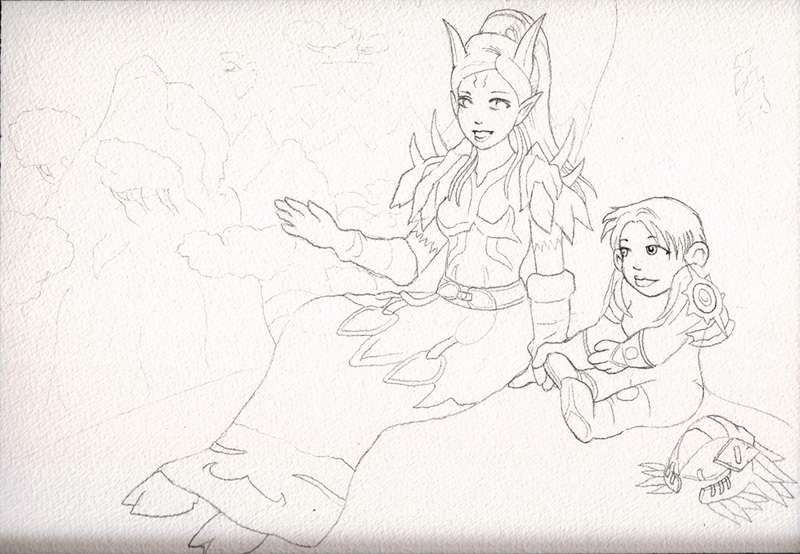 Anyway, that’s Teeny and Claire enjoying an afternoon in Nagrand! 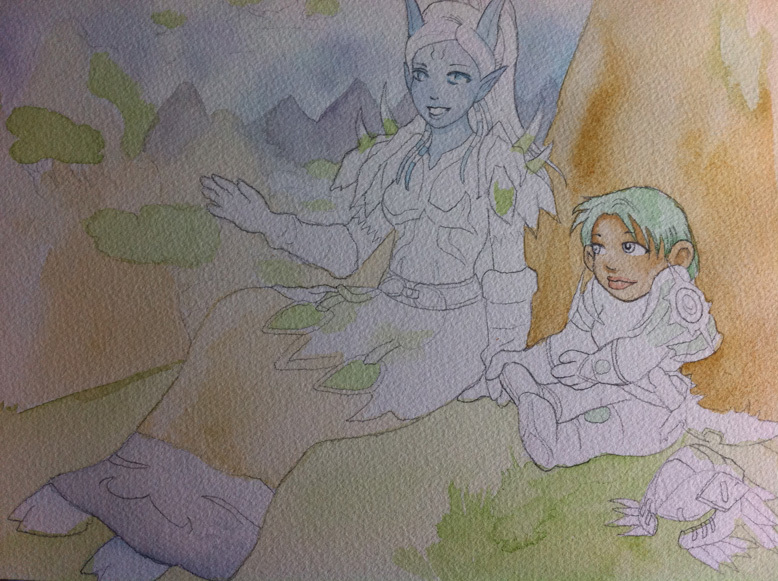 You know I love any commission that involves draenei. No, I don’t have a problem, why do you ask? I dug back a bit into my art archives to find something for this Tuesday. These are gnomes I did for Technophobia (on Twitter) back in December. They are all his gnomes: Curacao, Calsyee, Priggle, Kamarile and Chipotle. They’re all related! I don’t do much gnome art, so they were fun to draw.